Growing up, I always knew that no matter what mistakes I could make, my parents would always love me. It’s a bond that can’t be broken by missed curfew or misunderstandings… a parent’s love lasts forever. 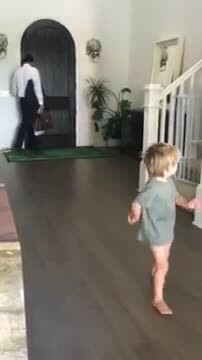 The little boy in this video certainly knows that to be true as he chases down his Daddy just to say “I love you” before Dad leaves for work. Looks like that special love goes both ways. In fact, this little guy loves his dad so much that he spends 3 solid minutes continuously telling him so. The best part? His awesome dad responds every step of the way, even stopping the car for a little extra love before he goes and honking his horn as he’s driving down the road. The entire interaction is absolutely adorable. The video splices together the highlights of those 3 minutes into an adorable clip, showing viewers the best of this precious father/son duo. There really is nothing quite like the innocent love of a child! Equally as beautiful is a father’s unparalleled love for his son. Check it out the precious moment of pure, heartfelt love below.